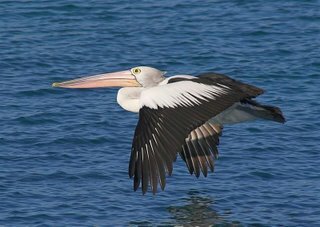 I was returning from Little Swanport on Monday (see posting below), and pulled in to the side of the road, just South of the Triabunna bridge, to count a small flock of Pelican. 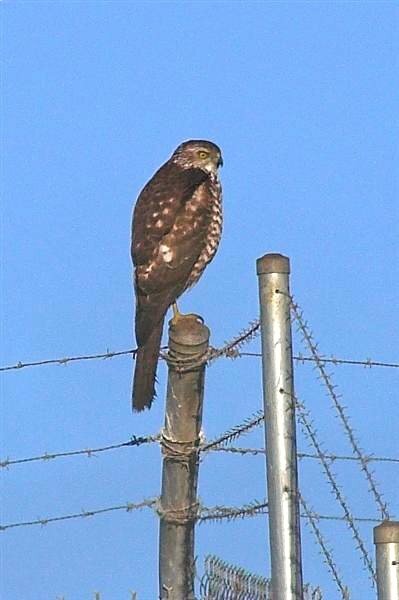 As I did, I noticed a robin on the fence wire, hunting insects. Using the car as a hide, I positioned myself to get a shot or two. The female Scarlet Robin (at left) was very obliging, returning to the same spot on the wire between sorties. As I concentrated on photographing this robin, I heard the familiar "tinkling" of Yellow-rumped Thornbills, but took little notice. 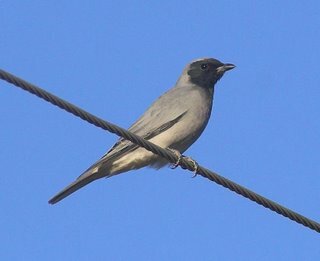 The continued "tinkling" eventually got my attention--the flock of about 6 or 7 birds, had landed on the wire alongside me and much closer than the robin. A hurried change of angle, enabling me to take a few shots (one shown at lower left), before the flock moved on. While the shot suffers somewhat from having a dark background, I was pleased to have come to grips with a common enough bird, but one that had eluded me (as far as photos go) . Are there less of them around this Winter? 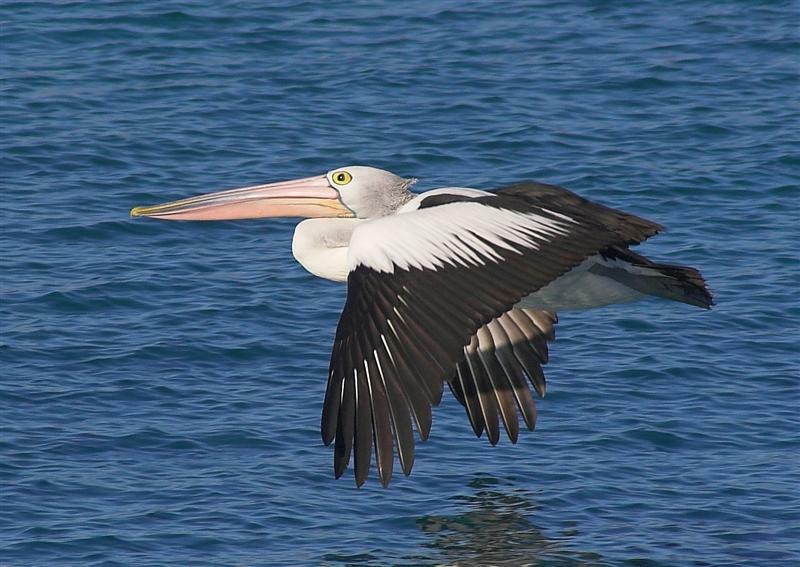 As I continued on my way feeling quite pleased with my good fortune, I realised that I never did count the pelican! On a beautiful Winters morning after a hard frost, I decided on a foray to the Saltworks Reserve, North of Triabunna. 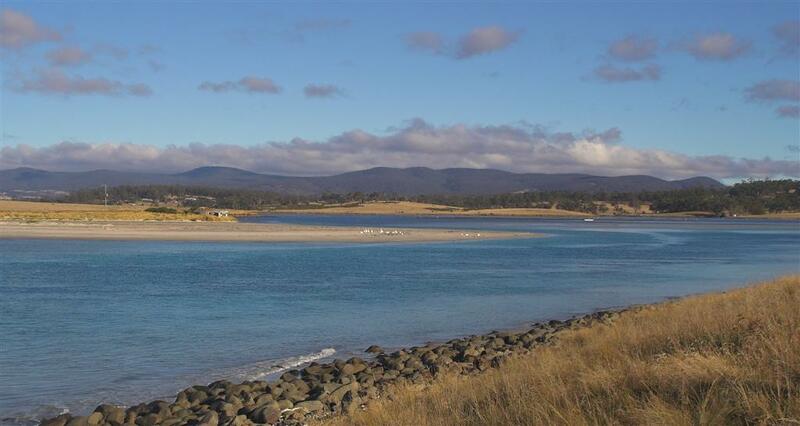 Scenically, probably one of the best, the picture at right was taken from the mouth of Little Swanport, looking inland. The spit in the middle ground, had a roost of some 32 Australian Pelicans this morning, 2 of which were banded(rt leg). Other birds occupying that beach included, c.10 Red-necked Stint, 2 Hooded Plover, several Pacific Gulls, c.15 Red-capped Plover and 2 pairs of Pied Oystercatcher. The most numerous species was Crested Tern, probably numbering 150+, but as they constantly passed from the oyster racks out to sea and back, that's a guess. Several of the Pelicans took off and headed North (including the one pictured). Other birds present in the area, included Little Pied Cormorant, Black-faced Cormorant, Australasian Gannet, Grey Butcherbird, White-faced Heron, Grey Currawong, and a solitary White-breasted Sea Eagle. 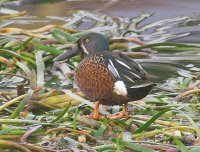 En route, I stopped briefly at Rostrevor Lagoon (about 1 km N.of Triabunna), and noted at least 12 Blue-billed Duck and 20+ Blue-winged Shoveller. 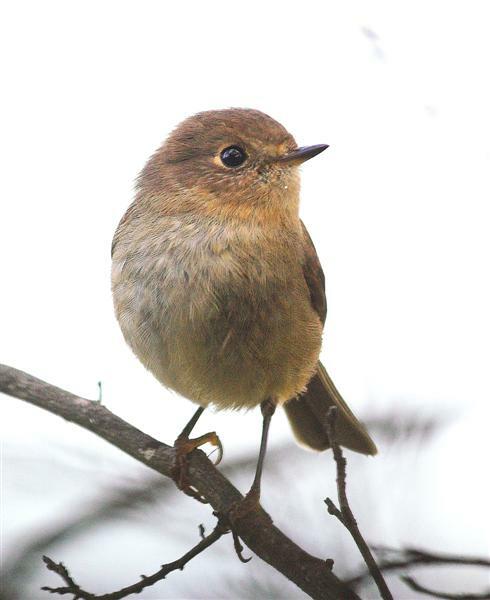 Rostrevor is, arguably, the most consistent spot in Tasmania to see Blue-bills. 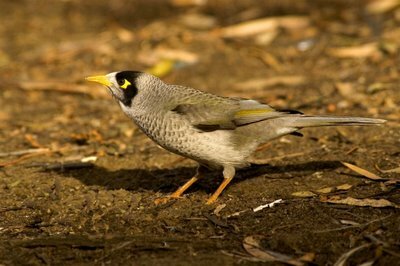 I suppose that one advantage of walking the same area frequently, is that you may notice small nuances of bird behaviour or numbers. My almost daily walk, takes me past adjoining gardens, past tree lined ovals and includes a small headland reserve, which includes a rocky shore. Yesterday, which was a little warmer than of late, I saw quite an increase in birds that infrequently are seen on this walk. 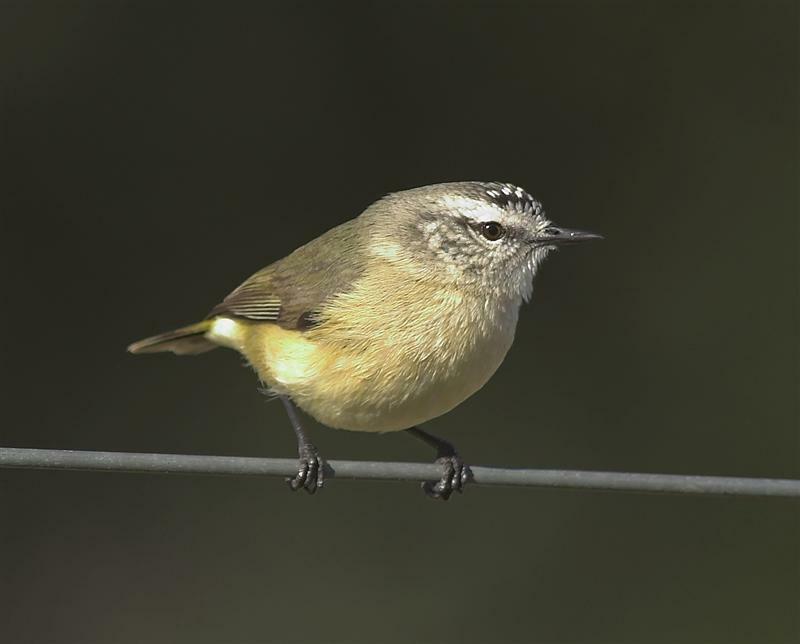 They included several Eastern Spinebills, Grey Fantails, Yellow-throated Honeyeaters and a few Scarlet Robins. I alluded to it being a little warmer than of late, earlier, and I can only suppose that this may have caused the very welcome increase. 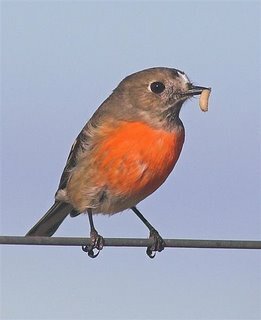 Well I'd almost wrapped this posting up and I was just checking on the images, when I realised that the image of the robin could be a female Pink Robin. It could account for it's behaviour, which was far more skulking than I would expect of a Scarlet (and quite alone). Unfortunately, it was photographed in deep shade, which confuses the colouring. Pink Robin do roam during the Winter, but would be a first record for this area. Any suggestions w ould be welcome. I'll add another angle image. 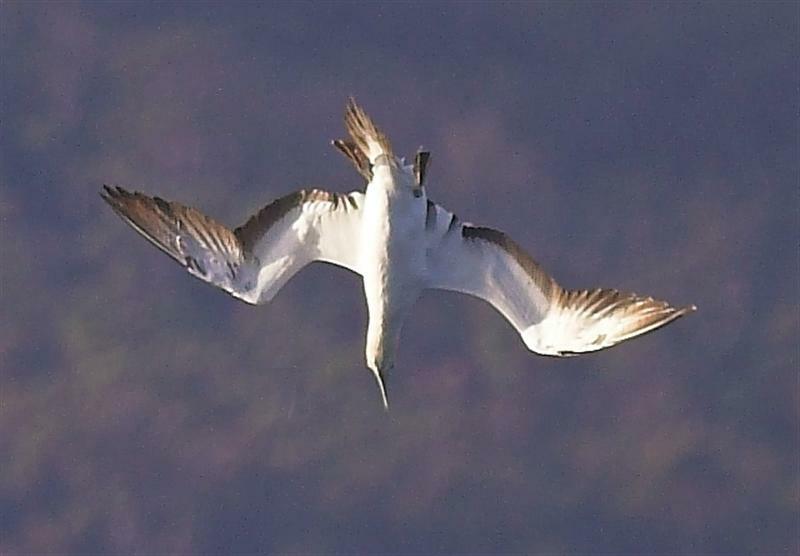 Another blustery Nor' Westerly wind in the River Derwent this morning and as I hoped, there were Australasian Gannets fishing fairly close inshore. If you want to photograph them, you have to be patient and be prepared to move to where they're fishing. I wasn't prepared. 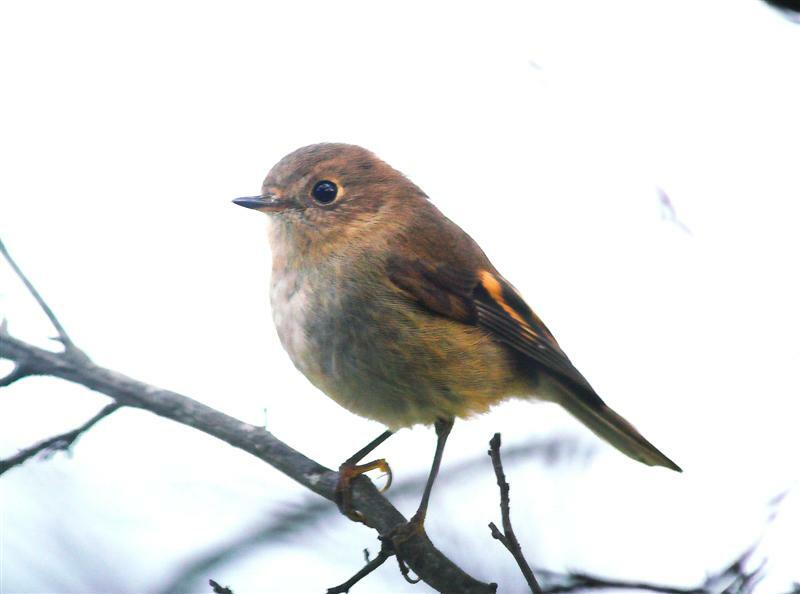 They were fishing in near mid Derwent when I first spotted them, but later moved into the lee of Bellerive Bluff. A dash home and a short drive enabled me to get close enough for the accompanying photos. I took a lot, but the birds were, in the main, just too far out. However, all was not wasted, as it gave me a chance to look more closely at their fishing technique. It really is amazing the control they can exercise when diving. 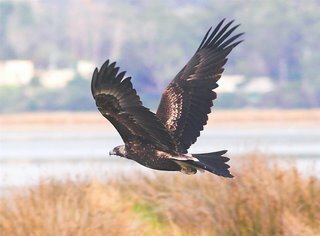 With the use of feet as "air brakes" and a tail that acts as a "rudder", they can make subtle changes of direction to finesse their dive. It's not really apparent as you watch them, but single frames enable close inspection of their flying "attitude". You can see a little of this in the pictures. As I mentioned in a previous blog on Gannets fishing, I never tire of watching them. You might have to put up with more shots! 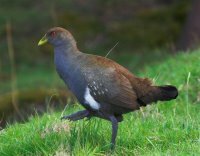 I was drawing up a list of Tasmanian Birds recently, using a number of sources, and I came upon a dilemma. What constitutes an introduced species? 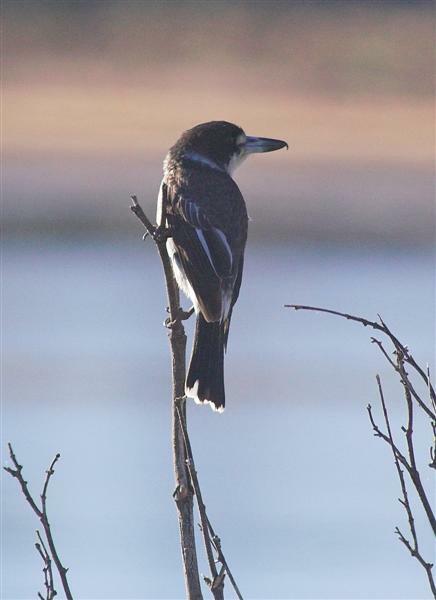 Some sources included the Laughing Kookaburra and Corellas as introduced, others as, presumably, 'self introduced', across Bass Strait, and therefore acceptable 'Tasmanian' species. 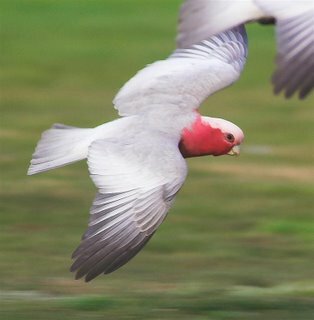 The Galah is known to have been introduced accidentally into the Huon area from a ship, in 1922. 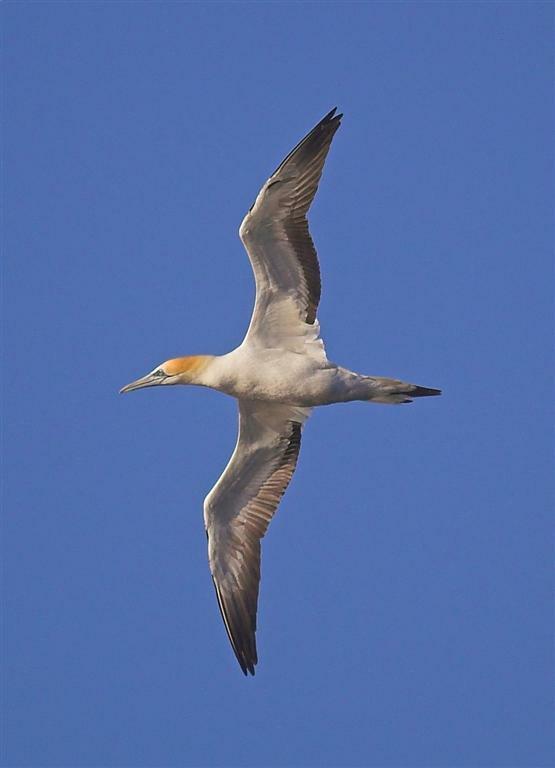 Perhaps those are the antecedents of birds that were frequently seen in the Kingston area for many years. 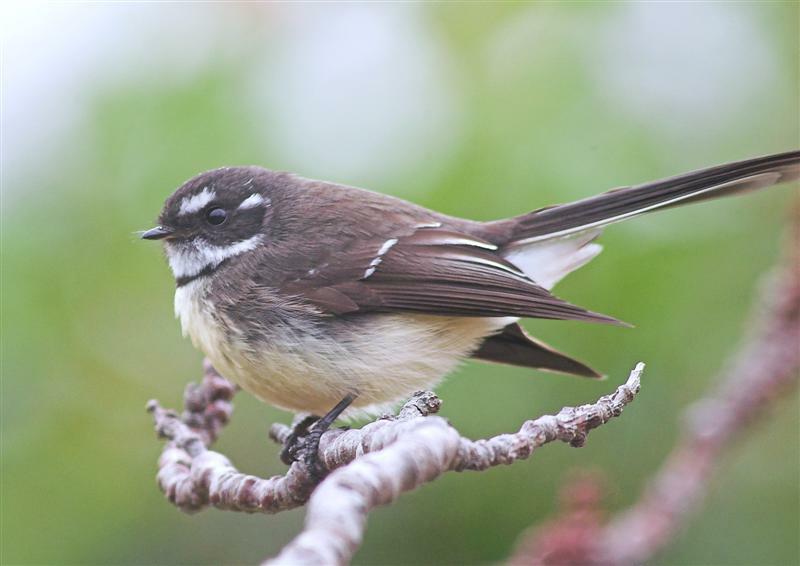 However, the numbers now regularly seen around the State, would, I suspect, more likely be the progeny of birds having made the crossing from the Mainland. Nowadays, there are substantial flocks in many outer suburbs of Hobart, totaling some hundreds of birds. 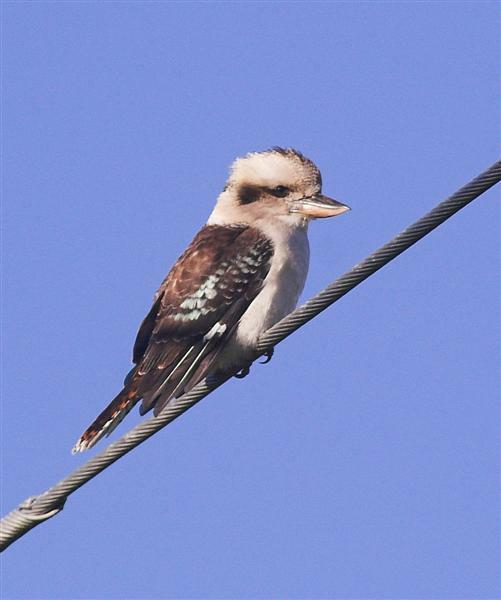 The Kookaburra, on the other hand, was known to have been introduced into the North and North East in the early part of the 20th century, and has gradually spread through the Island. Perversely, it is rarely listed as an introduced species. Perhaps it doesn't really matter except to the 'purist', and in many cases the question of the method of introduction of Mainland species, would be difficult to prove. The accompanying image of a Galah, was taken recently in the grounds of Clarence High School, Bellerive, one of the local flock numbering over 50 birds. My blog on Pacific Gulls coincided with Birds Tasmania's Annual Gull Count in South East Tasmania -- reported in today's Mercury newspaper. 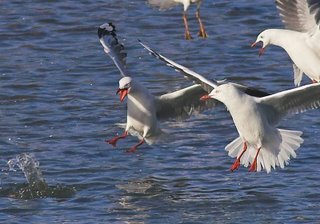 About 10,000 gulls were counted, of which about half were reported from South Hobart and Glenorchy tips. 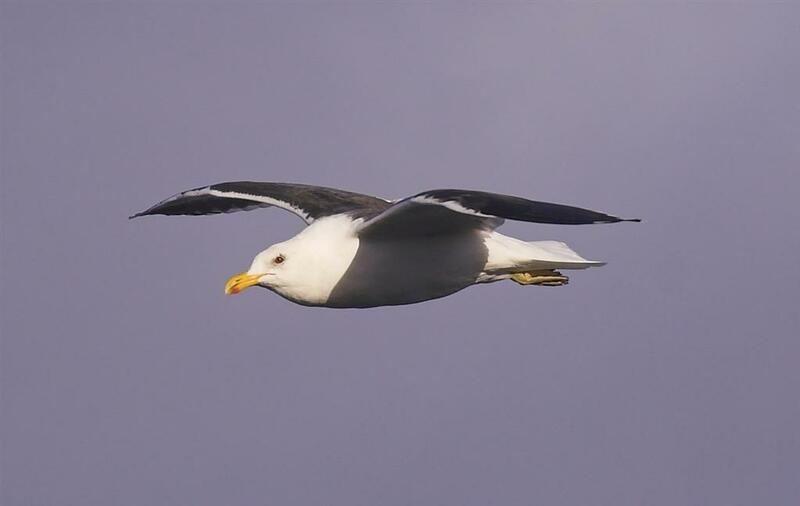 The major finding was that both Silver and Pacific Gulls are in decline, but the only other species, the Kelp Gull, has continued to increase. Its' numbers have increased by about 8 times since 1980. 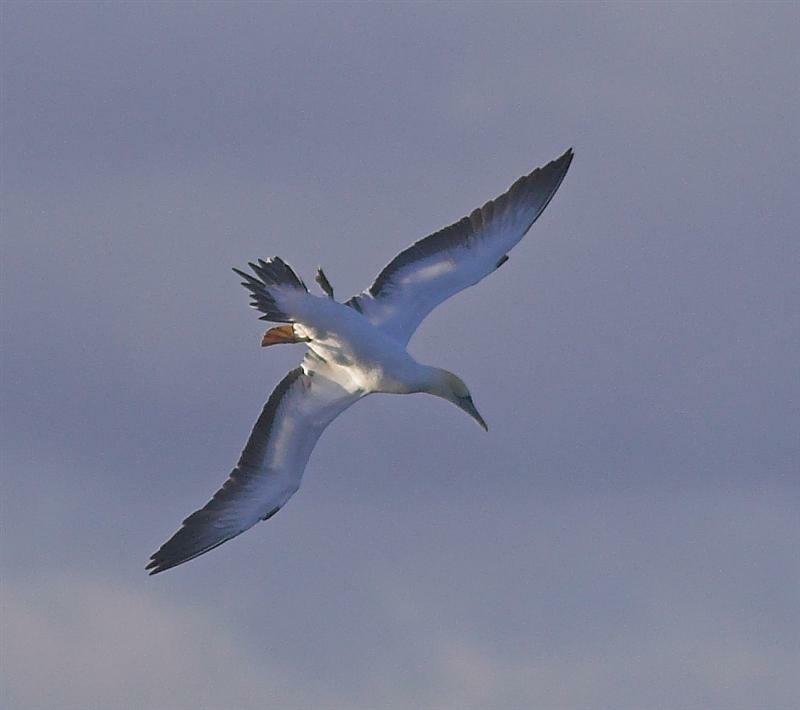 As I have mentioned in previous blogs, the Kelp Gull has taken over large parts of Orielto n Lagoon as a breeding ground, and is breeding in small numbers in other important habitat. 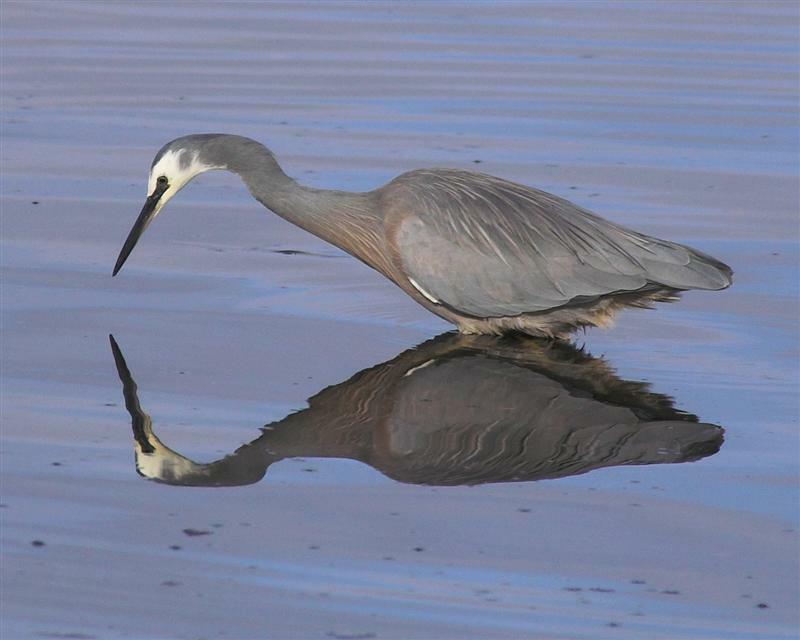 These habitats have been set aside for waders, both migratory and our own breeding birds. 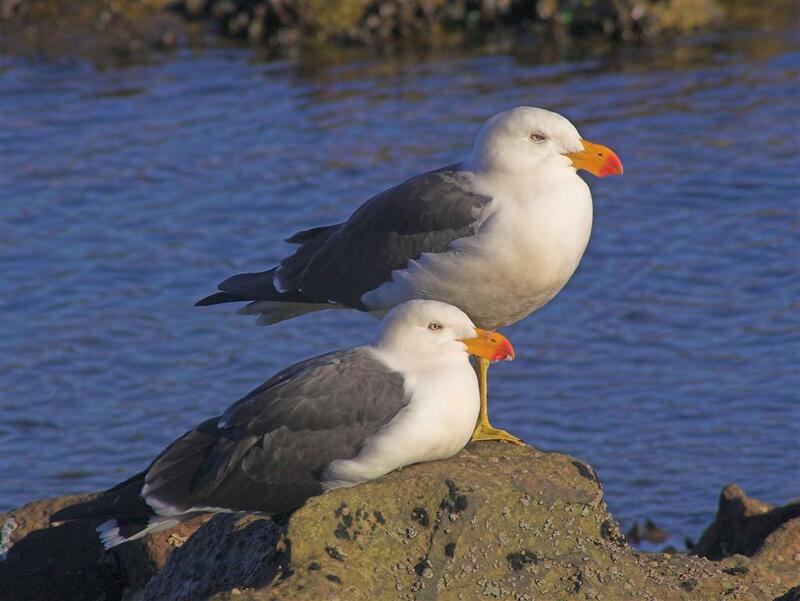 The invasive Kelp Gull is denying these areas to the very birds these areas were set aside for. 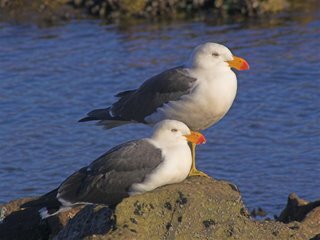 The numbers of Kelp Gulls breeding and competing for nesting sites with Pacific Gulls on offshore islands is also likely to be the major cause of the decline in Pacific Gull numbers. There have been programmes of culling Silver Gull eggs, mainly on the causeways where they represent a driving hazard. I think it's past time to put in place a plan to reduce or eliminate Kelp Gulls from vunerable habitat. Too often there is a lack of pro active planning, preferring, apparently, to wait until an issue requires the expenditure of many dollars and employs the 'experts' who could have prevented it happening in the first place. It's past time to address this issue. [Photos show, an adult Kelp Gull, and Silver Gulls (some of a flock of around 1000 birds at Sorell this morning)]. 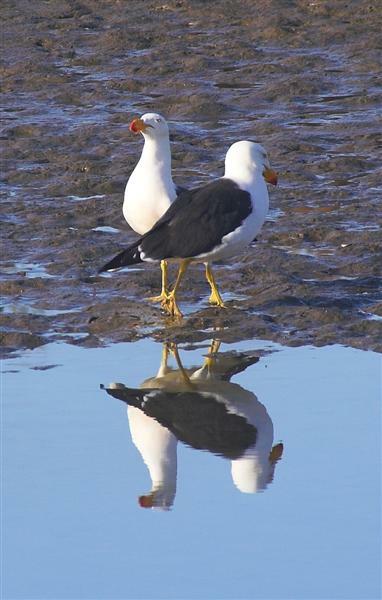 During a quick walk round the block yesterday, I photographed this pair of Pacific Gulls. The image rather reminded me of those Victorian studio portraits of married couples, with one sitting in the chair and the other standing dutifully alongside. Perhaps the analogy isn't so far from the truth. 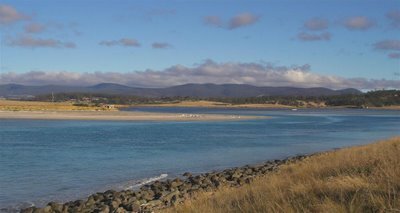 Many of the local Southern Tasmanian headlands and beaches sport a pair of Pacific Gulls, who take up a sort of Winter territory. They don't seem to be bothered by the Kelp Gulls, but another adult Pacific entering the area can expect to be challenged. This is usually a 'sizing up' of one another, presumably by the males, which includes walking around each other on 'tiptoe', but can end in more aggressive behaviour if that doesn't work. At least they seem to behave with more decorum than the similar sized Kelp Gulls! A touching pair! I've added this image to show part of the 'sizing up' of passing PGs. These 2 birds approached, making low guttural sounds, walked round one another holding themselves upright, until one bird backed down, then they continued on their way. It was all over in a minute and no contact was made. Of course, this is only my interpretation of what's going on! John Tongue writes: We're currently in NSW on holiday. Seeing good numbers of birds, considering most of our birding is being done from the car, while travelling between friends and relatives. 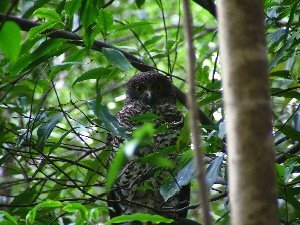 We were VERY excited, though, after many years of searching, to be able to finally tick Powerful Owl, (a very little photograph is attached). We were steered in the right direction by a contact from the birding-aus e-mail list to a likely roost in Chatswood, Nth Sydney. We called in straight off the (doomed) Sydney ferry, and stumbled on it first up! It really is exciting to add a bird that you've been searching for, for some time. If you're driving around some of the outer suburbs of many towns and cities of Tasmania at the moment, you're bound to notice the number of predatory birds. Most of them sitting on wires and suitable shrubs, often for many minutes at a time, watching for some ill timed movement of potential prey. Most of the prey seems to be insects, which still seem surprisingly prevalent, despite the cold. I watched the Grey Butcherbird pictured here (bottom left), as it sallied from shrub top, to catch insects, most of which were grasshoppers, returning to the same perch to eat the catch. 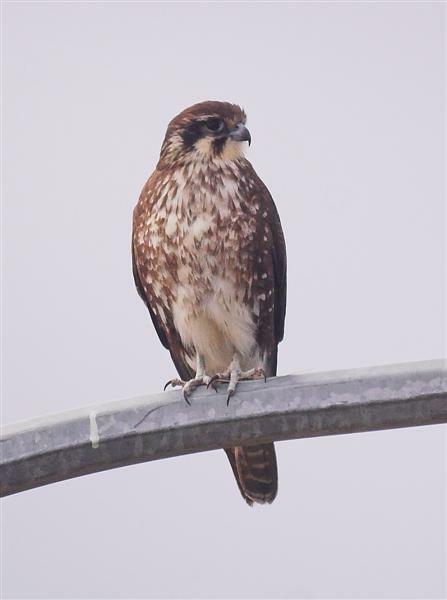 While most of the prey of the Brow n Falcons (bottom right) were also insects, the Brown Goshawk, (top right) photographed atop the perimeter fence at the Sorell chicken factory, appeared to have its eye on the small birds, mostly Starlings and Sparrows, attracted to the factory environs. I've seen what I assume is the same bird, on several recent visits. 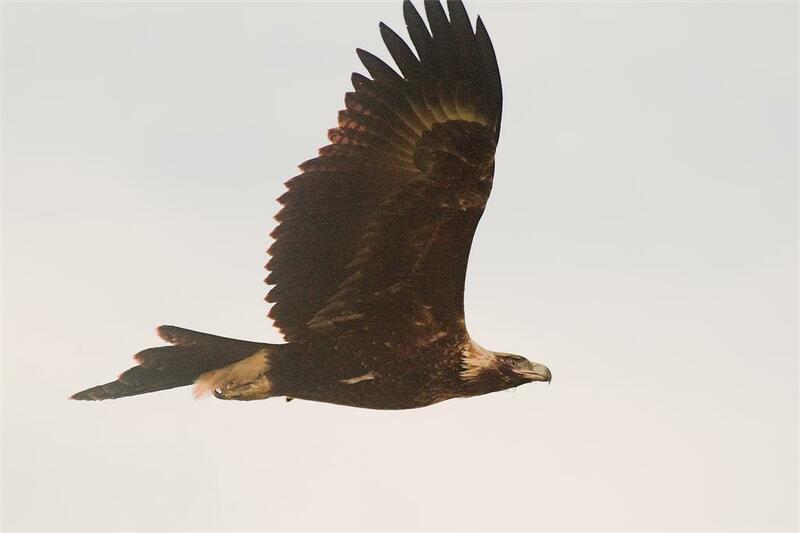 As I approached to photograph it on my latest visit, it was spooked by something at the factory and flew past me at no more than a few metres--far too fast to get a shot, but a memorable view none the less. 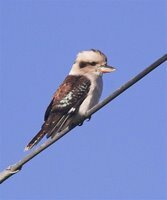 By far the most numerous of the "wire sitters" are the Laughing Kookaburras, (top left) often in loose family groups. The one advantage of this "waiting" stategy, is that it requires much less expenditure of energy, at a time of reduced food and shorter days. This large farm dam is one of my favourite birding spots. It's situated North of Colebrook, on the road to Oatlands, about a kilometre short of the Midland Highway junction. I ventured up that way yesterday in the frost and fog. Possibly because the birds were "grounded" by the fog, there were some hundreds of duck on it. It's one of those spots that you're better off staying in the car, and in a temperature well below zero C., I didn't need any convincing! Duck included c80 Blue-winged Shoveller (one pictured), c20 Grey Teal, 60+ Chestnut Teal, c80 Black Duck, 50+ Australian Shelduck, c30 Wood Duck, few Black Swan, a solitary Hoary-headed Grebe, and a very jumpy flock of around 15 Great Cormorant. There were also several Black-fronted Plover. 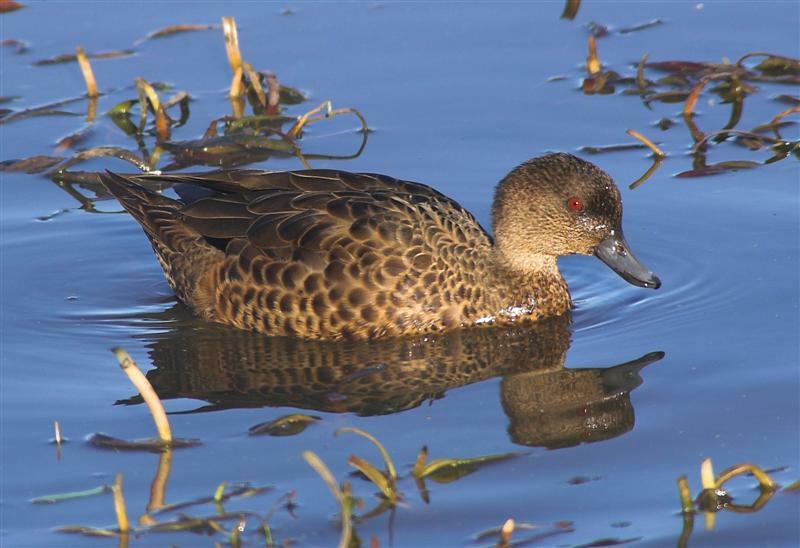 The Grey Teal are always interesting, as we seem to go months or longer without seeing any, and then they seem to suddenly appear. 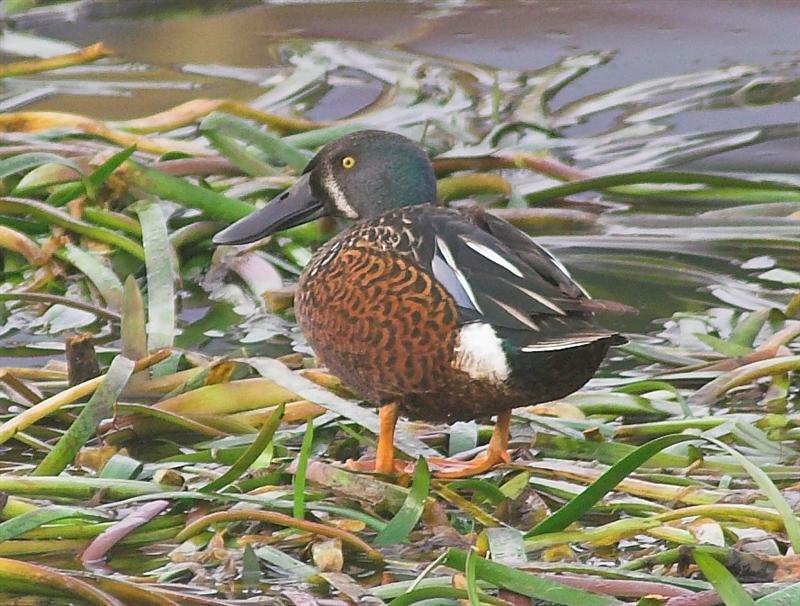 When I first started birding in Tasmania I didn't see any for some years, and I was beginning to wonder whether I just couldn't pick them from Chestnut Teal. 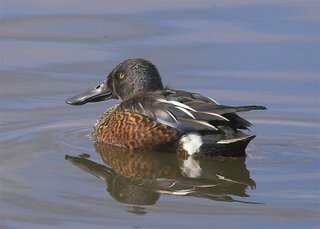 There followed a number of wet Winters, and they appeared in some numbers, and I realised that in reasonable light, they could be quite easily picked by their lighter coloured heads. I noted a similar number at Lake Dulverton later yesterday morning, also 8 Hardheads. 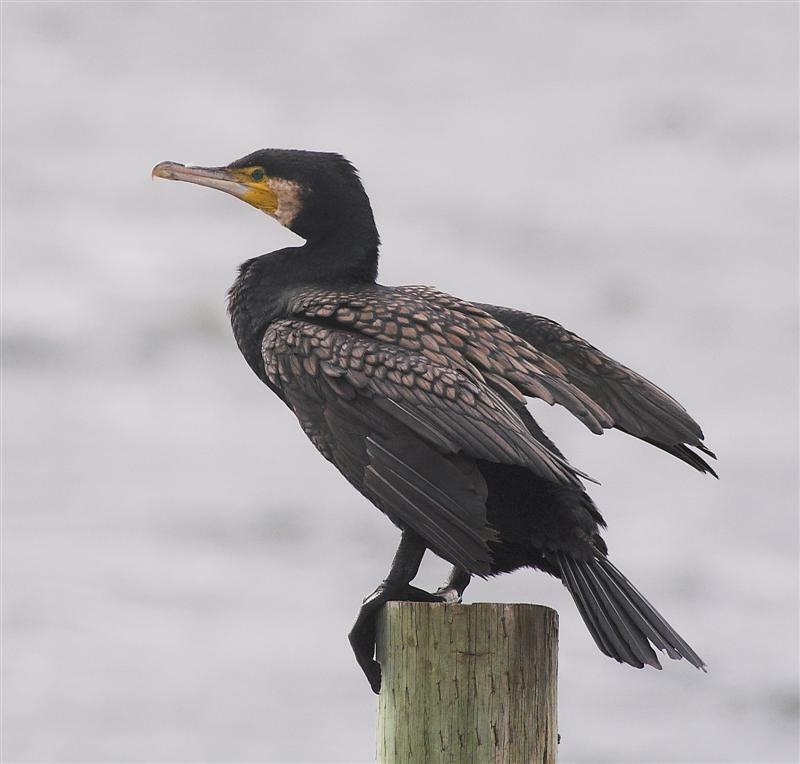 I wrote a blog a little while back entitled "Persecuted Cormorant". Shortly after that I received an e-mail from Priscilla Park pointing out that the Great Cormorant was not alone. In fact there are 4 species of birds that have no protection in law in Tasmania. If you or anyone else, want to shoot them, providing you have the necessary firearms permit, you can legally kill them. 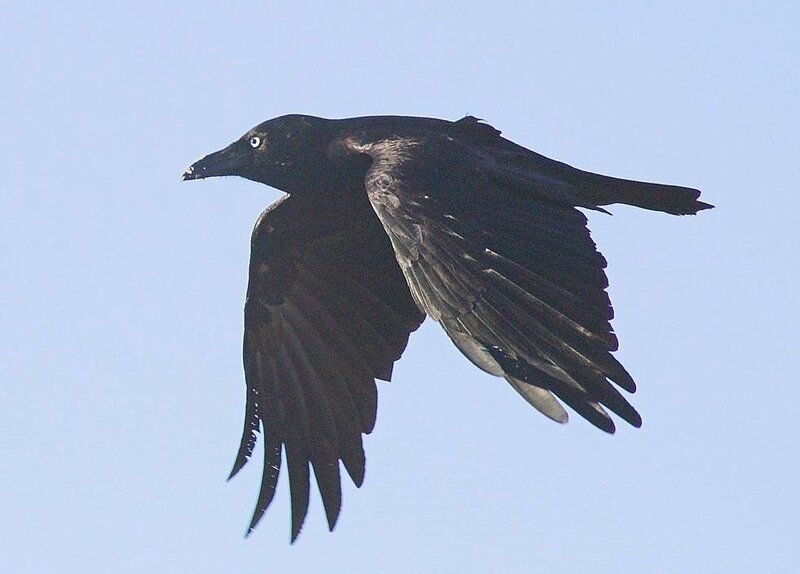 The species are those shown here--Forest Raven (a near endemic--if that's not a contradiction in terms! 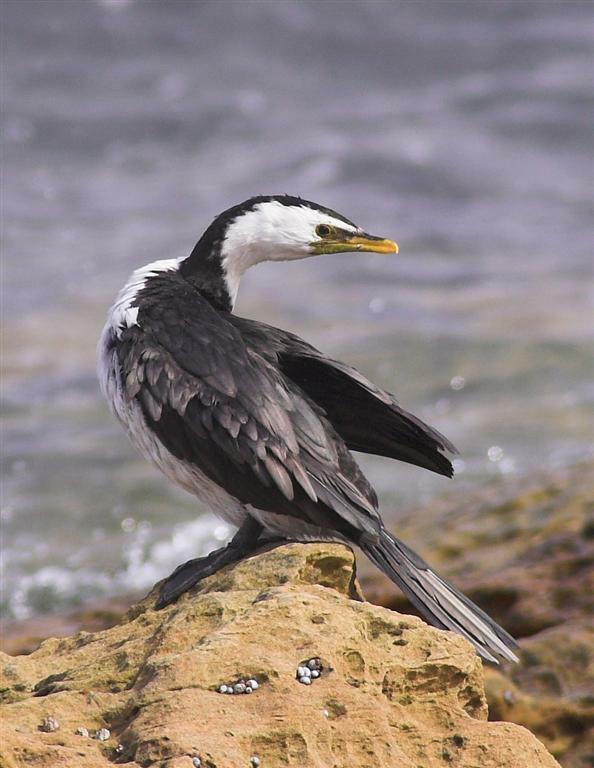 ), the Tasmanian Native Hen, which is endemic to Tasmania, the Great Cormorant and the Little Pied Cormorant. 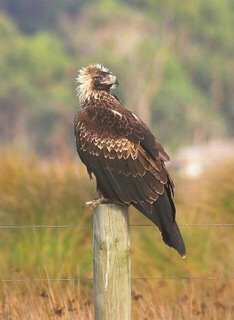 The Conservation Committee of Birds Tasmania has sought protection for these species, and regularly reminds the relevant authority of this. But decisions appear to get lost in that void, that we all know so well! 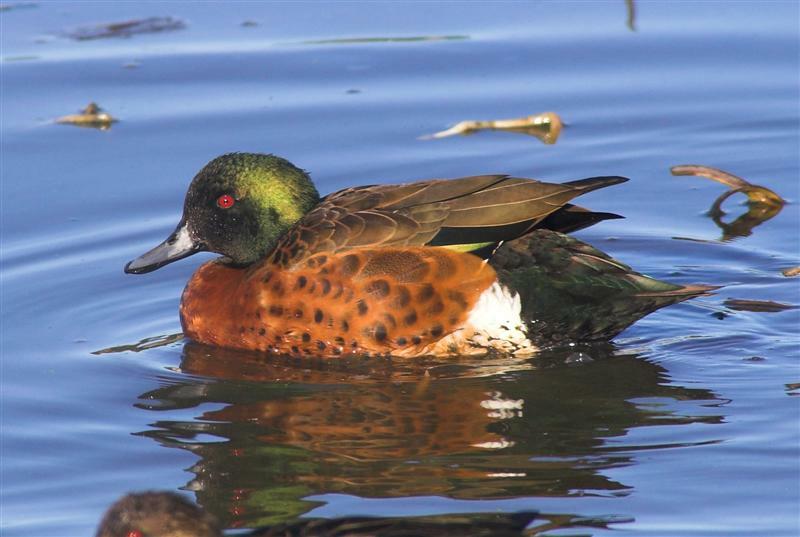 The changes would almost certainly only mean that if you have an issue with these species, you would have to get a permit before shooting them. That doesn't seem too hard to me, and is the way that other species are controlled--on the merits of the case. 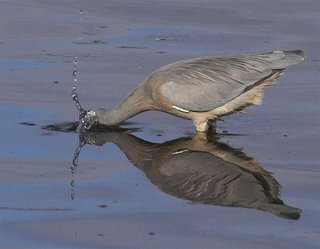 Hasn't been a great week for photographing birds, so on Thursday, more out of frustration than anything else, I visited the 'traps' on the Eastern Shore. Peter Willshire mentioned to me sometime back, that he had more pictures of White-faced Herons, than any other species, and after an hour spent watching and photographing this Heron, I can see why--they give you plenty of chances! 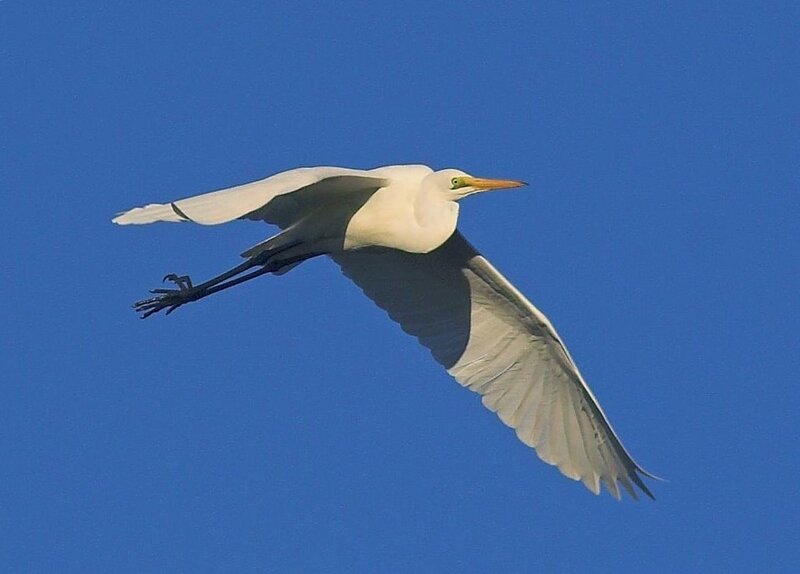 Taken from the car in a rest area just North of the Bowen Bridge as the tide rose, this bird was obviously used to the vehicles parked close by. 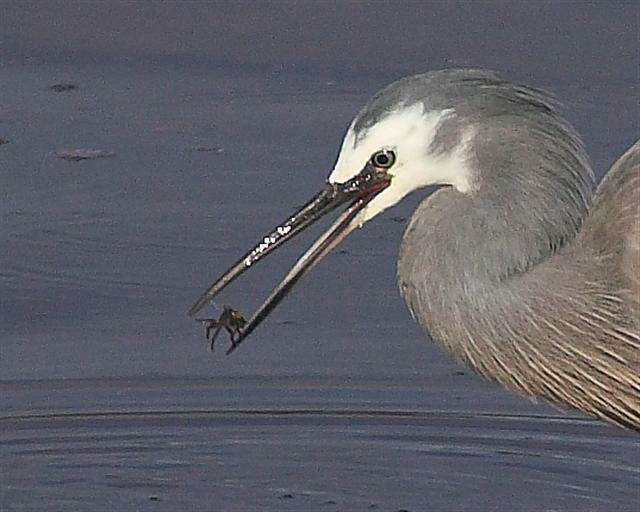 It seemed to be catching a fair bit of food, which I assumed was probably small fish. 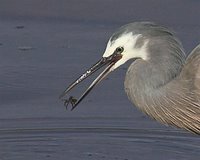 But after looking closely at the images, I found that in all cases, it was eating small crabs. If you click on the small image, you will see for yourself. Also at this spot were a few Pied Oystercatchers, Black-faced, Great and Little-Pied Cormorants, and the inevitable Silver and Kelp Gulls.